Manioc also known as Cassava and Yucca is a staple of traditional Brazilian meals. Manioc is a root tuber, this means that the plant has a "storage root" (tuber) which is used to store nutrients during periods when the plant is unable to grow. This edible tuberous root is similar to potatoes and is high in starch. Starch is a storage form of energy in plants and is a carbohydrate, which we use to fuel our bodies. Manioc is the third largest source of carbohydrates in the world! The Manioc plant can grow to 8 feet tall (2.4m) and has characteristic greenish-yellow flowers. There are two common types of Manioc used for food. The first is sweet and can be eaten raw, the second is bitter and poisonous unless it is properly prepared, as was identified by the Native Indians. The bitter Manioc contains a cyanide compound that is toxic, as a side note, many plants that taste bitter are typically poisonous. This is a common way to identify if a plant is edible when enjoying the fruits of the forest, so if you sample the smallest portion of an unknown plant in the wild and it tastes bitter DO NOT swallow as it could be toxic! Besides being eaten like a potato (boiling, deep frying, steaming) the Manioc can also be processed into meal and flour. In Brazil seasoned Manioc meal in known as Farofa and is found as a condiment on many tables. It is sprinkled on everything from soup to vegetables. Another way to process Manioc is to settle out the starch from the extracted juice and heat. This causes individual starch grains to pop and clump together, the end product is known as tapioca. 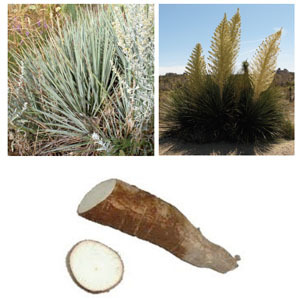 This plant as you can see has many uses as a food and is used in a variety of Brazilian meals, from making bread, eating as a vegetable, and serving as a dessert. However, the plant has other uses such as weaving ropes, nets, and baskets with the foliage or making soap from the roots. Furthermore, the plant has medicinal qualities which can be used to treat diarrhea, malaria, high blood pressure, headache, pain and can be used as a wheat alternative for people who suffer from Celiac's Disease. This is just one of the many examples of the various uses for one plant and how we can use plants to nourish our bodies and provide materials for shelter and clothing.